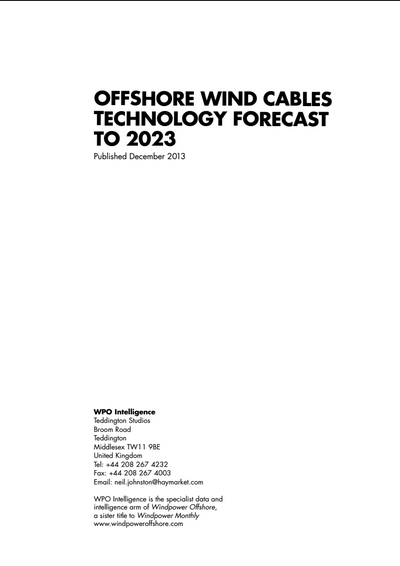 Based on extensive primary research this study Offshore Wind Cables: Technology Forecast to 2023 is the essential planning and strategy guide to developments within the fast growing offshore cables market. This major new study identifies and profiles the technologies expected to affect the sector to 2023. The report includes exclusive 10-year market forecasts and illustrates the trends and drivers, shaping the development and penetration of disruptive technologies. As offshore wind expands to meet the needs of energy-hungry countries, new doors of opportunity are opening for traditional industries. Wind farm developers are set to consume massive volumes of high-specification cable to transmit electricity to shore from wind turbines at sea. Transporting and installing these cables will need specialised vessels. Companies looking to enter this market need to understand the complex landscape ahead of them. Many pipeline projects are being planned farther offshore, a trend that will test the industry both technologically and economically. Development of wind farms at ever-greater distances from shore is fanning innovation in both cables and the instruments that condition the electricity they carry. This innovation involves strategic choices between alternating and direct current on transmission lines, as well as advances in adapting cables to withstand the physical stresses of the marine environment. A subsector of specialists is taking shape. At least 50 companies now have expertise in cable installation and seabed surveying, and this number is destined to grow. Shipbuilding is another active field: ships that are decades old can be adapted to the task of laying and burying cable, while new vessels are being custom built for this purpose—evidence of offshore wind’s ability to spur economic activity even in difficult times. 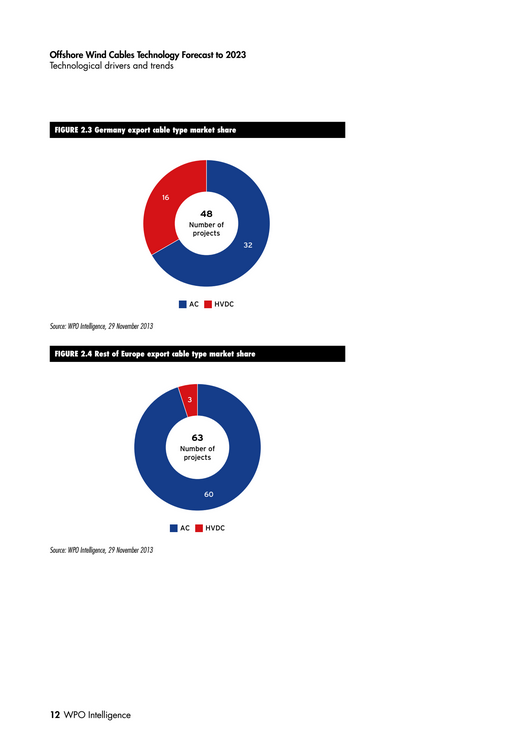 The WPO Intelligence database of projects was used to extract data for the graphics and tables contained in this report. We used a snapshot of the data that was taken on Friday, 29 November. Any new cable supply contracts information that we became aware of after that date will not be reflected in this report. Data were only drawn from ‘active’ projects—those that were listed in the database as being either ‘in progress’ or ‘online’ (388 in total). We excluded projects that had either been inactive for a long time (classified as being ‘dormant/on hold’ in the database) or were recorded as having been cancelled by the relevant developer. Of the 388 active projects, WPO Intelligence holds cable type information for 237. 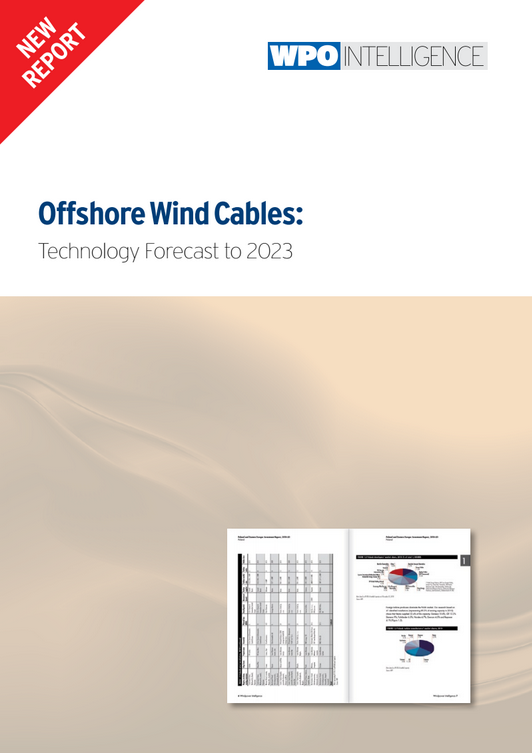 Cable demand forecasts were based on the assumption that the demand would materialise in the year preceding the year when the relevant offshore wind farm was estimated to come online according to data held in the WPO Intelligence database. For array cables, we calculated one cable length for each planned turbine, and assumed an average distance of 1km between each turbine and the offshore substation. 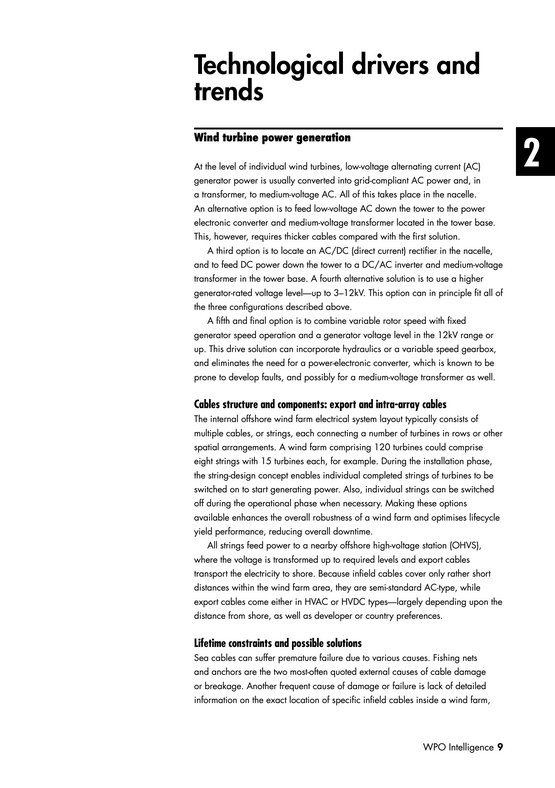 Numbers of turbines were estimated based on information WPO Intelligence holds about contractual commitments for the purchase of turbines when available. In their absence, company indications on which turbines and how many they intend to purchase were taken into account. 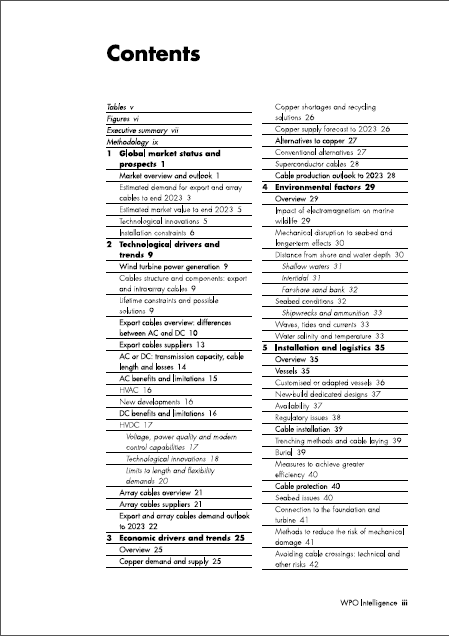 When a range was known, the average number of turbines was used for the calculations. When no information was available on the planned number of turbines, this was calculated starting from the wind farm’s planned capacity and based on average turbine size of 4.7MW for projects due to come online in 2015–18—the period used to forecast cable demand in 2014–17. This is based on the average turbine size, for projects where it is recorded, in the WPO Intelligence database. To forecast cable demand in 2018–23, we did not use pipeline data from WPO Intelligence as the time lag means the number of projects on the database would not produce realistic forecasts. We assumed instead—based on recent BTM Consult forecasts—that additional average capacity of 10–12GW would come online annually in the 2019–24 period, sparking cable demand one year earlier as stated above. range used in the forecast of installed capacity. The 6.4MW average turbine size was arrived at based on information available in our database combined with known market trends for turbine size. Regions were allocated shares of forecast additional capacity in 2019–24 based on their share of forecast capacity in 2018 according to WPO Intelligence data on known planned projects. Similarly, regions were allocated shares of forecast export cable demand in 2018–23 based on the relationship between installed capacity in 2018 and export cable demand in 2017. Distance from shore was calculated as recorded in the WPO Intelligence database of offshore wind farms. For the projects where distance from shore was not known, we used the average distance from shore of the 234 projects for which it was known. This was 45km.